Like I’ve mentioned in my previous post, most of the Disney YAHs (first versions) were put on sale, namely, California Adventure had the price tag of $9.99! I hope you guys used this as an advice and stashed both Disney California mugs? No? 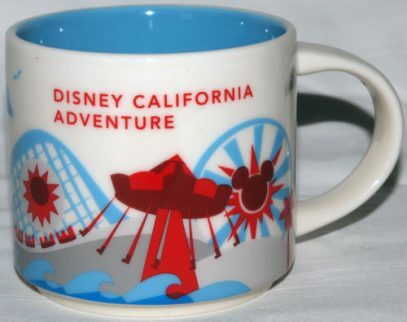 Well, that’s too bad, since the new You Are Here California Adventure mug hit Starbucks stores today. I will be honest with you, I think this new design is too simple, but I like the color scheme more than first version. With this new mug, the count of Disney Mugs has reached 13!